We all know drinking lots of water throughout the day is important for so many reasons – to hydrate, flush out toxins, regulate digestion, for heathy skin… the list goes on. However, sometimes sipping plain old H2O can get a little boring. By using these simple ingredients you can add loads of flavor without additional sugars and calories of store bought flavored water. My favorite combination is cucumber, lemon, ginger and mint. Not only do these ingredients add delicious flavor- they offer so many health benefits. Lemon- lemon is a powerful cleanser and also helps to alkalize your body. Lemon also contains Vitamin C, which will help boost immunity. Ginger – ginger contains many anti-inflammatory properties. It also helps aid in digestion, settle your stomach, and helps with flushing out toxins. Mint – mint is a natural stimulant, which helps soothe the digestive tract. It also stimulates the digestive enzymes that absorb nutrients from food and consume fat and convert it into energy. Therefore, it is helping you convert the food you consume to energy rather than storing it as fat. As a natural stimulant, mint is known to naturally combat fatigue and help to recharge your batteries. Cucumber- cucumber has many detoxifying, antioxidant, and anti-inflammatory properties. It also adds a refreshing taste and leaves you feeling refreshed and hydrated. Thinly slice 1/2 a the cucumber, ginger (as much as you desire) and a lemon or two. Add in a few sprigs of mint and add all ingredients to a pitcher of water and let sit overnight. Sip throughout the day. Next to our number one hydration buddy, water, tea is the runner up on the most consumed beverage in the world. I love this statistic! Whether you like it for the taste, the endless health benefits, the comforting warmth or just the sophistication of having a cup of tea, there are plenty of health benefits as to why we should up our tea consumption. Eastern medicine has looked towards teas and herbs for centuries, and there are proven studies to show just how powerful these plants can be in health and longevity. The 5 most common teas are black, white, green, herbal and oolong. Each tea has its own special powers – all benefitting our body in different and powerful ways. Below we give a brief summary of the main benefits of the different popular types. Looking and feeling younger is something that we all aspire – white tea can give us a lift here. The properties of white tea can help inhibit the wrinkle process with its power of strengthening elastin and collagen. Goodbye crow’s feet and forehead wrinkles! Black tea is shown to lower our blood pressure, decreasing out risk for a heart attack or stroke. Green tea is our saving grace with its ability to increase the body’s ability to burn fat. Also, with weight loss, green tea is shown to increase our metabolisms, therefore making it easier to burn off calories faster. The antioxidants in green tea help our immune system put those free radicals to rest – fighting off cancer and other harmful disease. Green tea can also strengthen our bones. Oolong tea is fragrant with a fruity hint that includes multiple benefits to our bodies. Oolong tea can help reduce heart disease, inflammatory issues and aids with high cholesterol levels. Many Eastern practices use this for weight loss as well. Herbal teas have endless amounts of health properties and medicinal purposes. Depending on what you need (stress relief, sleeping aid, energy booster) specific herbs blends in can be your cure-all in a cup. From detoxing, energy boosting, nausea reducing, skin healing, constipation, even helping mother with lactation and women with menstrual cycles, different herbal teas and blends can work wonders. Do some research on what you are looking for and go to your local loose leaf supplier for the cure (instead of your pharmacy!) Make sure to contact your physician or an experienced herbalist when consuming large amounts or different herbals teas/blends (especially when pregnant). Also, make sure you aren’t overdoing teas that contain caffeine (green, black, white and red). Caffeine is good in moderation but can also cause added anxiety, sleep disturbances and dehydration. Feel free to sip on most herbal teas all day though! Now let’s get specific. What do we need? What does our body crave? 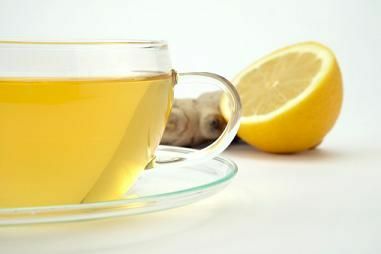 Check out these 3 tea recipes: one for detox, energy and last but not least a stress reliever tea! 2. In a large pitcher add your juice to about 2 quarts of water, a couple droppers of vanilla stevia to taste, a couple dashes of cayenne and your thinly cut lemon slices. 3. Mix well with a wooden spoon and adjust flavors to taste. 4. Let sit for about 10 mins before serving to let the flavors blend. Will last about 5 days in the fridge. 1)Combine all ingredients, stick’em in the bottle. 3) Bottle up and enjoy! • 1 Tbsp Orange or lemon rind. 1. Heat 2 quarts water until almost boiling. 2. Add the St. John’s wort and oatstraw and steep for 6 minutes. 3. Add the rest of the herbs and steep for an additional 3-4 minutes. 4. Strain herbs and sweeten with honey if desired. I love purchasing loose tea in bulk- it cuts down on price and more importantly – wasteful packaging materials. If you do prefer buying packaged bags that are conveniently prepared, make sure the tea is organic. Many commercial tea bags can contain harmful toxins and chemicals that will end up counter acting the health benefits from the teas. My two favorite brands for herbal and medicinal teas are organic Alvita and Traditional Medicinals.